Our Train-the-Trainer program allows local environmental professionals and experienced volunteers to conduct trainings and lead community scientists in data collection for NYSHI research efforts. Our certified trainers will host HWA talks and trainings and report attendee numbers to NYSHI. Our goal with this program is to expand HWA awareness and our training capacity throughout New York State. 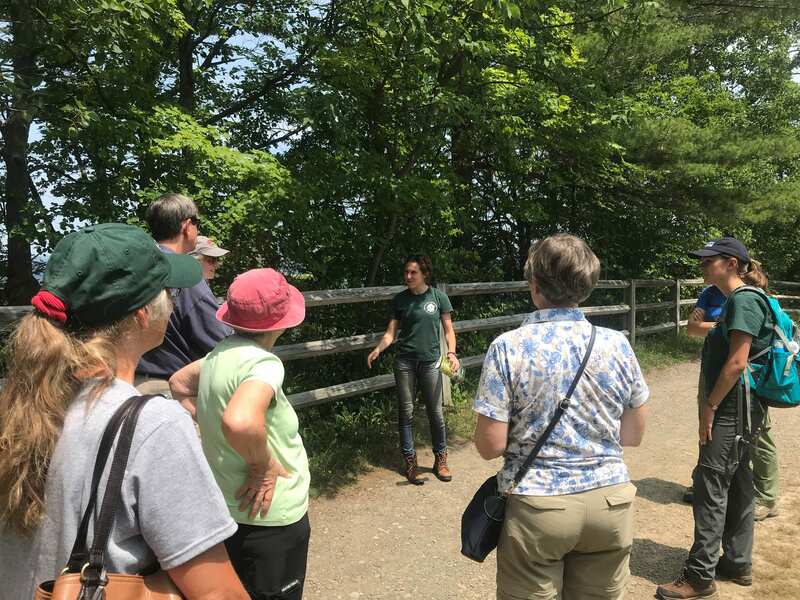 The Train-the-Trainer program helps increase the capacity of the NYS Hemlock Initiative to educate and train volunteers around the state and provides hemlock and hemlock woolly adelgid materials for use by local environmental educators and organizations. Potential trainers must have strong hemlock and HWA identification skills, be able to use powerpoint for presentations, and be familiar with using iMapInvasives for reporting HWA findings. Trainers are required to participate in a NYSHI Train-the-Trainer training event prior to hosting their own trainings. During this event, potential NYSHI trainers will become familiar with the educational content for presentations including basic HWA biology and field surveying techniques. Each Train-the-Trainer event will have an outdoor component that includes a short HWA survey so that potential trainers may become familiar with field methods for HWA data collection. Following completion of this training, NYSHI trainers may then schedule and conduct their own talks and trainings. Each talk should consist of a powerpoint presentation, while each training will feature both a presentation and an outdoor field site visit to look at hemlocks and practice surveying for HWA. Trainers will have access to scripted presentations for their particular geographic area, hemlock and HWA identification guides, HWA surveying guides, maps, and an HWA survey protocol that trainers can use to lead outings for attendees. If you have any questions about becoming a NYSHI Trainer, email Charlotte Malmborg at cm933@cornell.edu. Interested in becoming a NYSHI Trainer? If you would like to train HWA volunteers with us, fill out the survey below and we’ll be in touch. If yes above, how many iMap points have you entered and how many were for HWA presence or absence?